Moviegoing takes on a whole new vibe at these summer viewing venues that combine a party atmosphere with eating and entertainment. Movies on the Green : Warner Center Park in Woodland Hills is the locale for this annual summer event where outdoor family movies are presented on Saturday evenings, July 13 – August 24 from 7 p.m. – 10 p.m. Films are projected on a 30′ screen with digital projection and 7.1 surround sound. Brings chairs and blankets. Annie kicks it off on July 13. Food vendors are available. Pierce College Farm Center : This Friday evening affair combines a certified Farmers Market including food trucks, and a FREE outdoor movie on the Farm through September 20th. Market is open from 5 p.m – 10 p.m. with movies starting after dusk. For more information about the movie lineup, contact the Pierce College Farm at (818) 999-6300..
CSUN Summer Movie Fest: Come by for FREE movie nights in Northridge on Thursdays through August 29 in the Sierra Quad Lawn. Each movie will start at sundown between 7:30 p.m. and 8:15 p.m. Kettle corn and fresh lemonade will be for sale. There’s also free balloons and face painting. Bring blankets and lawn chairs. Oscar Outdoors : This is the Academy of Motion Picture Arts and Sciences open-air movie theater in the heart of Hollywood. Movies are showing Saturdays through August 24. Tickets sell out as quickly as they go on sale. Located just south of the ArcLight Cinemas, it is part of a 7.5-acre site called Academy Hollywood, which also includes the Pickford Center for Motion Picture Study — home to the Academy Film Archive, the Science and Technology Council and the Linwood Dunn Theater. Tickets for each Oscars Outdoors screening are $5 for the public, free for children 10 years and younger and $3 for Academy members and students with ID. Seating is unreserved. Gates open at 6:30 p.m., and screenings begin at sunset. Attendees are encouraged to bring low lawn chairs, blankets and warm clothing. Various food trucks will roll in for the screenings. Eat See Hear : These are roving events that include the movie, live music and food trucks. Every week it’s at a different location from Santa Monica to Downtown. Watch a 52-foot-wide projection screen and enjoy food from a variety of food trucks.Runs Saturday evenings through September 14. Cinespia: It’s the fourteenth season of outdoor screenings at the legendary Hollywood Forever Cemetery. Bring a picnic, pillows and blankets, but no high back chairs, dogs or bbqs. Alcohol is permitted. Sit back listen to a DJ spin tunes before the screening which is cast on a mausoleum wall. Gates open at 7:30 pm and the screening is at 9 pm. No reservations and $10 donation is suggested at the door. Parking on grounds is $5.Founded in 1899, the cemetery is listed on the National Register of Historic sites and is the final resting place of famous studio heads, writers, directors and hundreds on Hollywood’s greatest stars, including Johnny Ramone, Cecil B. DeMille, Jayne Mansfield, Rudolph Valentino and Douglas Fairbanks. Street Food Cinema : This summer event series started at Exposition Park downtown and then moves to Grand Park (this locale is a free event! )on August 3. Both park events will features movies, gourmet food trucks and music from emerging Los Angeles musicians every Saturday through Labor Day weekend. Movies are presented with cinema quality sound and projection on a screen that is 40 feet wide by 22 feet high. Doors open at 5:30 p.m. Bands play at 6:30pm. Movie begins at 8:30 p.m. The $10 grounds fee includes access to food trucks, entertainment, park amenities and free movie. Group rates are also available for 4 people or more. Old Pasadena Film Festival: The four-week, free movie series, returns July 5 – July 27. The mostly outdoor film festival will celebrate motion picture in all its forms showcasing a variety of audience-pleasing movie titles and genres. With nineteen screenings, the Old Pasadena Film Festival is the largest open-air film festival in California . This year the festival pays tribute to film noir and suspense films. Distant Lands, the specialty travel bookstore in Old Pasadena, will screen travel documentaries such as the quintessential summer film The Endless Summer. 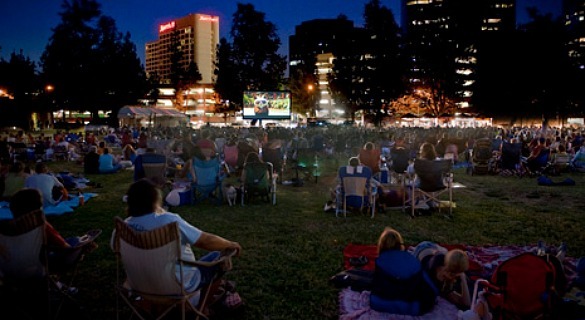 The Old Pasadena Film Festival gives attendees the unique experience of enjoying four weeks of award-winning cinema in unique outdoor spaces. All screenings are free and open to the public. For more information including a complete schedule, visit www.oldpasadena.org/filmfestival.